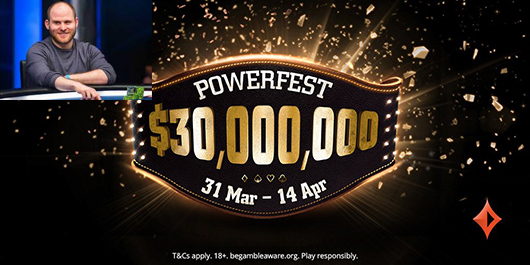 Tags: partypoker, powerfest, Sam Greenwood. Posted on Tuesday, April 02, 2019 by "T". 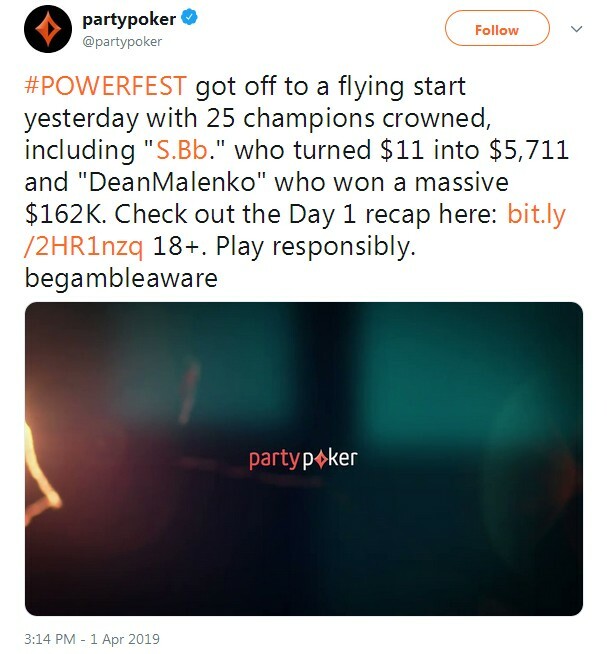 March 31 was quite a momentous day for many online poker tournament players, especially those who have participated in partypoker's POWERFEST series. The nickname that Sam Greenwood used in this event is DeanMalenko. This $5,200 buy-in tournament event was set to award 6-figure payouts for the top two players, and it was Greenwood who emerged victorious amongst a player field of 141, and he took home a nice $162,079.50. Not bad for a weekend sesh! The 30-year-old Canadian poker pro's current total live earnings is $15,731,079, according to the Hendonmob. 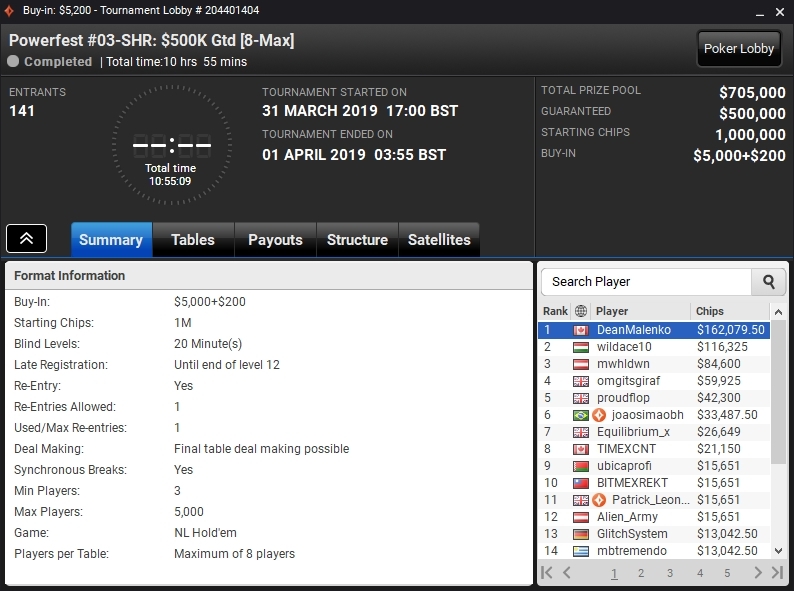 9 comments for "Sam Greenwood wins a partypoker POWERFEST event for $162,079"
Canadian players play very well poker but many of them are of American origin or from other parts of the world. 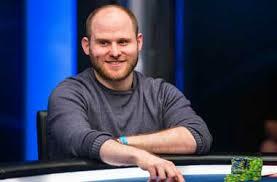 Sam Greenwood is a very good Canadian poker player and its results have demonstrated this. He succeeded a beautiful performance and his talent is very large. He did very good games in his career. well this tournament didnt bring so many players and thats why prize pool isnt so big,when you look on buy in and how big is!ofcourse is nice money for first place,but when you invest 5200 dollars,you would expect to have bigger prizes!congratulations to winner! Good for him, congrats in order or whatnot etc. Altough he payed 5k for the opportunity of making a one-time 30x ROI it seems the rest of the guys in the top10 did not get the chance to win that much of money at all. as a prize for the first place, but still a very good amount. Yeah it always baffles me on these tourneys - it's harder to get onto the final table than to take it down at the end yet it pays like mediocre either way. For me the feeling of winning a tournament is not so great, if the prize is a small one and if the players are few. I did not win any tournaments with over 700 players and real money. Instead i won over 10 freerolls games between 700 and 2460 players. The feeling would be very good if i won a tournament with over $ 25k and great with over $100k but this is very difficult. 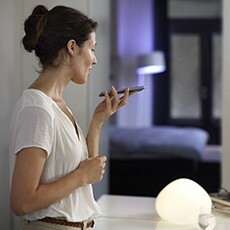 If the time would allow us to learn more strategy then chances would increase.